Even if you cannot image spending a single day without having a gaming session online, GameHug Arcade might look like a pretty useful application for you, but we strongly recommend against installing it on your computer. In fact, if you happen to have this application, you should remove GameHug Arcade right away because it is not completely safe. The application is categorized as a potentially unwanted program, and it means that GameHug Arcade has some features that could be considered detrimental to system’s security. As a result, the sooner you get rid of this application, the better. Technically, it should be possible to download GameHug Arcade from the main website. The main website for this application and multiple other games can be accessed via gamehug.com. However, whenever we tried downloading GameHug Arcade from its homepage directly, we would only be redirected to an error page, saying that the page we were looking for cannot be found. Nevertheless, even though the download link at the official website is broken, there are still many ways for GameHug Arcade to spread around. Our research specialists suggest that GameHug Arcade often gets distributed bundled with adware applications. This would mean that users download and install the application without even realizing it was part of the app setup. In other words, when programs are distributed in software packages, users are only concerned with one particular program they have been looking for, and they don’t pay attention when other additional (and most probably unnecessary!) features get installed as well. As far as the official functions of GameHug Arcade are concerned, if we take a look at gamhug.com/assets/arcade, we would see that this application is promoted as a tool that provides you with exclusive access to new games and special deals. Also, it should ensure a “fast and easy web search, no matter what website you’re visiting.” On top of that, GameHug Arcade can be connected with the most popular social networking platforms, thus supposedly rendering the application extremely user-friendly. Unfortunately, GameHug Arcade doesn’t live up to its promises. The program might also be associated with some websites that distribute adware and might even be exploited by cyber criminals. So if you want to protect your computer from harm, you will see to it that GameHug Arcade gets removed as soon as possible. We would like to point out that removing GameHug Arcade manually may not be enough to ensure your system’s safety because there might be some files or registry entries left. Hence, the best to way to protect your computer from severe infections is to acquire a powerful antispyware tool and perform regular system scans with it. Open Uninstall a program and remove GameHug Arcade. Go to Uninstall a program and remove GameHug Arcade. Click the Start button and go to Control Panel. 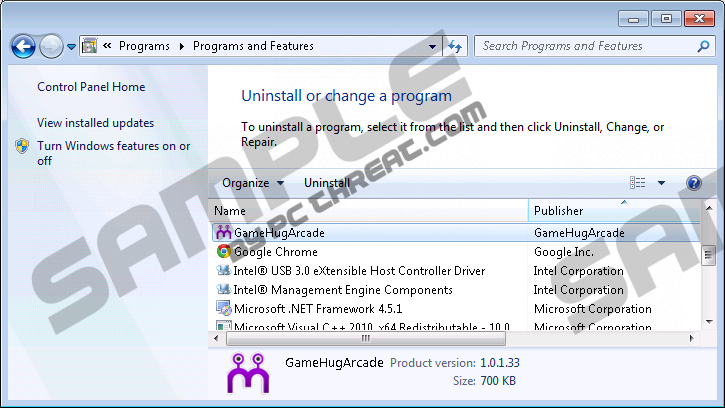 Select Add or remove programs and uninstall GameHug Arcade. Quick & tested solution for GameHug Arcade removal.